I usually only write about travel on my blog, however, when this dropped into my inbox, I was too intrigued to turn it down. 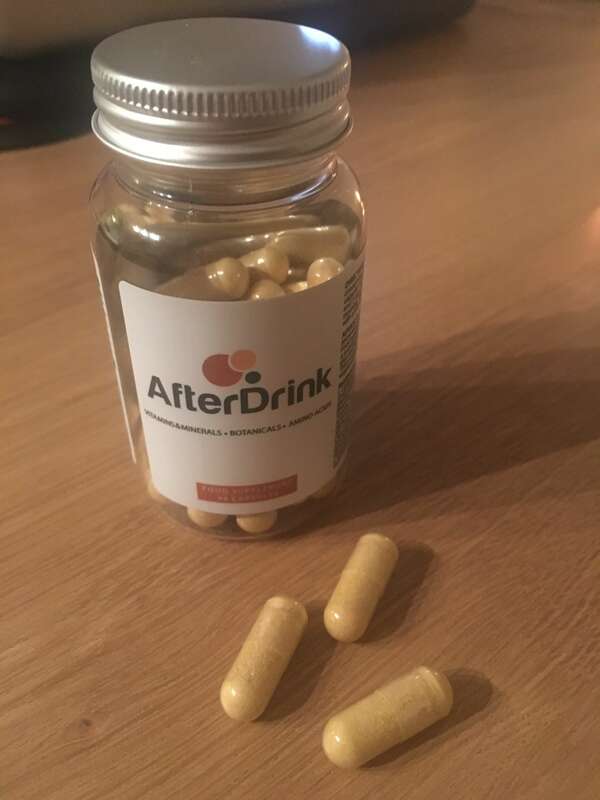 I was given the opportunity to try out AfterDrink, a multivitamin which claims to help take the edge off after a big night out. Now, as you know I am partial to a glass of prosecco or two (or 10!) of an evening and, as I’m rapidly approaching my 30s, my hangovers are just getting worse and worse. There are occasions when I’m still feeling the after effects of a heavy night a couple of days later – not ideal – and so I was really looking forward to trying something that would help with my hangovers. AfterDrink is a hangover remedy which is specially designed to counteract the effects of over indulging in drink. Each capsule is jam-packed with 26 ingredients which have potent anti-oxidant properties. The supplement works in harmony with the body’s natural defence systems by helping it to repair and replenish exhausted stores. You simply take three of the capsules before bed and then three in the morning when you wake up, each with a full glass of water. If you’re already feeling queasy, taking three capsules and drinking a whole glass of water may not be the easiest thing to do but force them down – it’s totally worth it! I’ve had a couple of big nights out in the last couple of weeks including a friend’s 30th birthday party and a night out in Manchester (blog post about Manchester coming soon!) and I took AfterDrink on both of these occasions. I woke up hangover free with no hint of a headache or nausea – which was great! I still felt able to do things whereas usually I’d just be dying on the sofa all day, and even spent a full day shopping the day after drinking. I’ve even been taking the capsules when I’ve just been for a couple of drinks. The only thing I don’t think it cured was tiredness – I still felt exhausted from the late nights that I’m just not used to any more. Anyone who knows me will tell you that I’m constantly tired anyway! AfterDrink is all natural and vegan-friendly and contains amino acids, ginger which is an anti-inflammatory and anti-oxidant, artichoke and lots of other vitamins and minerals. 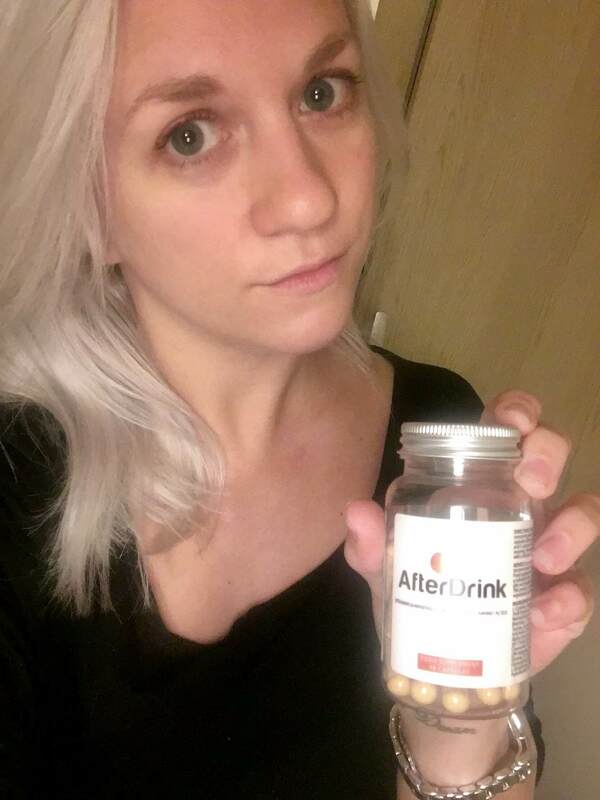 I’m a big fan of taking vitamins as sometimes I’m so busy that I don’t take care of myself as much as I should and I think AfterDrink is a great way of replenishing what you lose from drinking…and get rid of those post-drink guilt feelings! Find out more and get your own hangover remedy here.